Have you ever wanted to go out to eat with a group of friends or family members, but the group just can’t decide on the kind of cuisine they want? Should it be Mexican, Italian, Asian or California fusion? Your problem is solved if you go to Dominic's Table, which opened a few months ago in La Jolla. Although the restaurant features Italian dishes, it also includes wonderful dishes from around the world. We recently enjoyed a scrumptious sampling of dishes at Dominic’s Table and were impressed that each cuisine was beautifully presented and delicious. It was an unusually chilly and rainy night in La Jolla, but we felt cozy and warm in the welcoming ambiance of Dominic’s spacious but inviting setting. A fire was glowing in the fireplace, jazz was playing in the background, and friendly folks were congregated around the cheerful bar enjoying Happy Hour specials. We were seated at a lovely table and welcomed by personable Chef Dominic himself. We learned a bit about Chef Dominic’s interesting background. He grew up in a food-focused family and learned to cook at his mother’s side when he was very young. His family owned various restaurants so he also gained invaluable restaurant experience. Although he was raised in Kentucky (as the youngest of 8 boys), his love of food is rooted in his family’s Sicilian heritage. He eventually opened his own restaurants in Indiana and Kentucky. He became known in the culinary world because he won an International Pizza Championship. 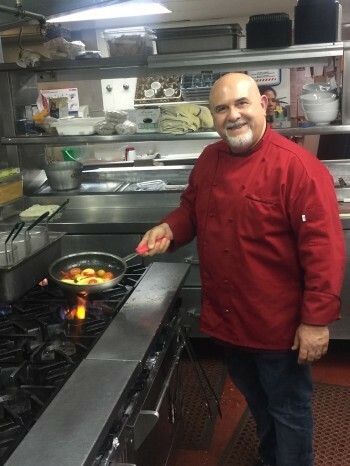 Looking for some formal training, he earned a culinary degree in Las Vegas where he spent 16 years as a chef at the MGM Grand and other celebrated venues. In Vegas, he learned to cook a variety of cuisines while satisfying the palates of a demanding clientele with varying ethnic palates. This explained to us why he has such a varied menu with lots of Italian and some Southern dishes but also Thai, Indian, Korean, and Mexican. Last year he and his fiancée, Elsa, discovered La Jolla and knew this enchanting beach town would be the perfect place for their new restaurant venture. They considered several sites, but fortunately, the site of the popular Roppongi Restaurant, which had recently closed after many years, was available, and they snapped it up. It is a beautiful setting for a restaurant in the heart of La Jolla with an outdoor patio featuring a flaming bonfire. 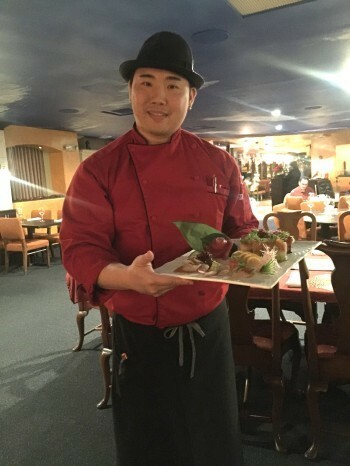 When we met charming Chef Dominic, we knew right away that he could be a cooking show TV star so we weren’t surprised to learn that he has appeared on a variety of cooking shows, including Emeril Live. Even before the Food Network existed, he did a live cooking show in Salem, Indiana. He has launched his own production company, Red Velvet Entertainment, which is currently developing a series of cooking shows. (Look for Chef Dominic on a cooking channel soon.) He is also appearing in several upcoming movies, including a paranormal thriller opening in January. His magnetic and warm personality draws in anyone around him. To say he is a “renaissance man” is an understatement. Chef Dominic offered to bring us a sampling of his favorite dishes, reflecting a variety of cuisines, and so we happily sat back and waited for his dishes to appear. Our server, Derek, who has been at Dominic’s Table almost since it opened last May, was friendly and helpful as he brought us dish after dish. After ordering glasses of wine from the restaurant’s nice wine list, we were awed by a beautiful sushi platter prepared by classically trained Sushi Chef Takuya Kudo, who was at Roppongi, and has been a sushi chef for 18 years. 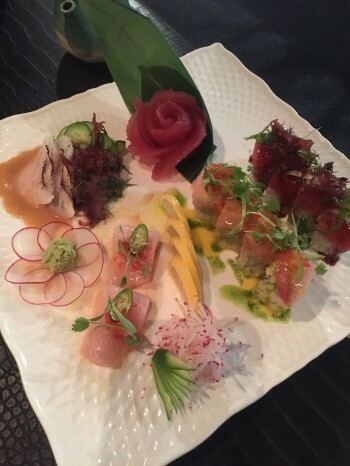 The platter included sushi rolls of yellowtail and mango and seabream and red snapper. Amberjack carpaccio was also a highlight. The presentation was stunning, almost too lovely to eat, but of course we savored every bite. Dominic’s Table also includes a raw bar with all kinds of raw fish besides sushi, such as oysters and ceviche. Next Chef Dominic sent us his delicious signature meatballs, made of topnotch ribeye and porterhouse, served in a rich marinara sauce. 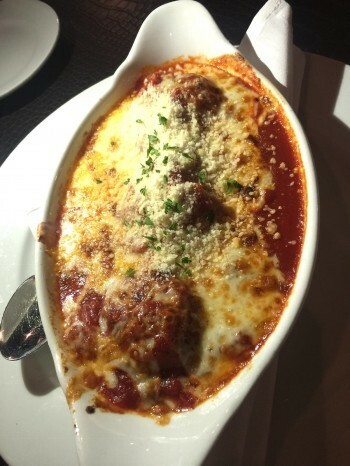 We learned that Dominic’s Table is known all over La Jolla for these special meatballs. We also sampled Bulgogi, a classic, flavorful Korean dish made with marinated steak that had been grilled with green onions and shitake mushrooms and served on steamed rice. We loved this dish. Finally, the Chef sent us one of his favorite dishes, Branzino, fresh sea bass in a delectable white wine sauce with capers, olives, and red and yellow cherry tomatoes, all sitting atop creamy mashed potatoes. The flavor combinations in this dish were unique and heavenly. While we were requesting some to-go boxes since we were a bit full, a dessert of cannoli arrived. The cannoli shells were crispy and crunchy and held an airy creamy ricotta filling. 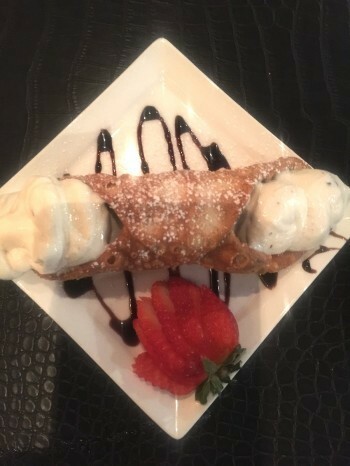 This cannoli is among the best we have eaten. We will be back to Dominic’s many times when we visit La Jolla. There are so many other dishes we want to try such as Shrimp and Grits, Thai Tom Yum Guong Noodle Soup, Chicken Mole, Linguine Alla Pescatore, Fettucine Alfredo, Veal Marsala, and Ossobuco. The menu is extensive and includes a wide variety of enticing dishes from different cuisines. 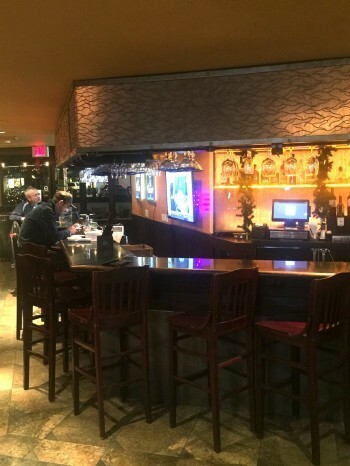 Dominic’s Table is open Monday-Thursday from 4 p.m. until 10 p.m. and on Fridays, Saturdays and Sundays from 8 a.m. until 10 p.m. A daily Happy Hour between 4 and 6 p.m. offers specials on wine and beer. Specialty top end sushi rolls are 50% off on Sundays. The restaurant also hosts special wine dinners, usually held on the third Tuesday of each month. Call 858-352-6811 for reservations. Dominic’s Table is located at 875 Prospect St. in La Jolla.